Being that I’ve cooked pad thai for so many people during my current two month stay in Canada, I’ve decided to post the recipe here. It’s very similar to the recipe that I followed when I learned how to make it in Chiang Mai, Thailand. 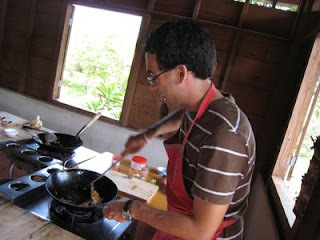 Here’s the website for the particular cooking class I went to in Thailand. It was really good! The quantities of ingredients are approximate since I generally add ingredients in an approximate way. rice stick noodles – Should be the kind that are flat, white, and translucent. One package of noodles serves about five or six people. small red chilies – Most people prefer “1 chili” of spiciness. the “Rob” level of spiciness is about “3 chilis”. Ensure the chili is chopped up into tiny pieces. extra firm tofu – Cut into small cubes. One standard sized block of tofu serves about four people. garlic – About one clove per person (to taste). Cut up very finely. You’ll also need a big wok and spatula for stir frying, a bowl to soak noodles in, and some method of crushing the nuts (mortar and pestle / bag and hammer). This recipe can be made vegan by removing the eggs. I’m not sure of a good substitute for them. The tofu could be replaced with chicken or shrimp, if desired. 1. Soak the noodles in warm water to soften then. 2. Heat up oil in wok on medium heat. 2. Add garlic and chili and fry a bit. 3. Make space in wok, add an egg, scramble and mix. 4. Add a handful or two of noodles. 5. Pour tamarind sauce and soy sauce on noodles and mix it all up and fry for a bit. Depending on the saltiness of the soy sauce, you can add some salt as well. 6. 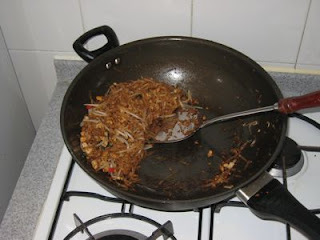 Add green onions, bean sprouts, crushed peanuts and mix up and fry for a short bit. 7. You’re done! Serve the food. Which, brings me to the conclusion. . . Oh, Robbie, my friend, feel like cooking for me? All valid comments. I’m happy to make pad thai for people. I always make one serving at once (though it’s kinda on the big side), so I don’t have so much of a problem with flying tofu. I think frying the tofu well first is like the key step that makes the pad thai super. This looks amazing. I also have a really hard time with the rice stick noodles… If I use warm water they never soften, if I put hot water they get mushy. . . any tips? I put them in boiling hot water, but I take them out after only about two minutes. They take a very short amount of time to cook. Would it work if I used satay-marinated tofu, instead of plain? Yeah, probably. It would taste more Indonesian than Thai, but I think it would still taste good. That’s really the most important thing. Jamaican Jerk Tempeh Wraps « the taste space – steam, bake, boil, shake! Coleslaw with a Spicy Almond Dressing (aka Raw “Pad Thai”) « the taste space – steam, bake, boil, shake! Foodie Gift Ideas, Part 2 (aka My Favourite Ingredients in the Kitchen) « the taste space – steam, bake, boil, shake! Vegan Pad Thai with Tofu and Kelp Noodles | the taste space - steam, bake, boil, shake!